I’m not sure how exactly to describe PlayerUnknown’s Battlegrounds (hereafter to be referred to as PUBG) in a succinct way. Yes, it’s just a game about survival arena battles, which sort of puts it in the same territory of DayZ or Rust, but PUBG is faster. It’s more ruthless, and the constantly encroaching kill-zone outside of the Blue Wall forces constant movement. There’s no camping in PUBG, barely any moments of rest. If you aren’t checking the horizon for other players, you’re making sure you’re safely within the White Circle for the next purge. 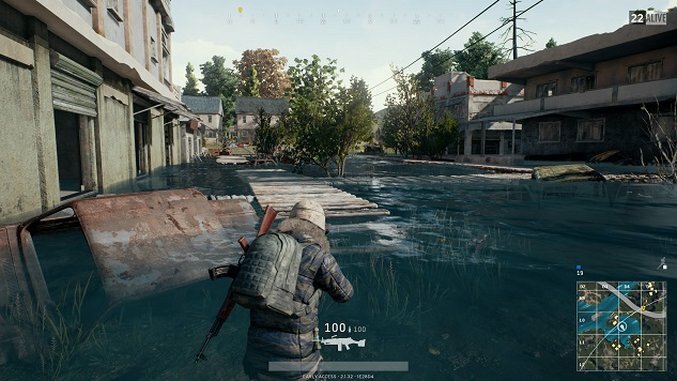 Right around the middle of the current only map for PUBG is Water Town. That’s not its official name; as far as I can find it doesn’t actually have a proper name. Players call it Water Town, or they call it Venice. The title is descriptive—it’s a small hamlet in the pseudo-Eastern-European style of the rest of the game, but unlike every other town in the game, about half of the structures in the town are flooded, at least partially. Most of the encampments in PUBG feel like paintball obstacles—they’re there, yes, but they don’t seem to say much about their own history. Inside this garage there is a rifle. Inside this house there is body armor. True to the form of the game, it feels like someone, or something, placed these objects here for the players to find and murder each other with. Water Town feels different. By pure virtue of being flooded, the mind goes to the obvious past. There was a time when Water Town wasn’t flooded. People might have lived here. Many of these survival-arena style games trace their heritage back to ARMA, the infamous military simulator developed by Bohemia Interactive. ARMA is known for its wide locales devoid of most life, playgrounds for military interaction on a grand scale. Empty houses become holdout points, troops move in vehicle or on foot toward their next objective. It’s this “playground” mentality that made ARMA (and the many games drawing inspiration from it) into a magnet for creative play. But somewhere along the line, the world itself took a backseat. PUBG’s “Erangel” is as blank of a canvas as it could be, dotted with interesting places to shoot guns and “cities” without histories. Ultimately, this feels like it feeds into the deepest thematic tones of PUBG, a hedonistic game show where surviving (and killing) are the only items of importance. And in the middle of it, Water Town, and its sunken homes. My first game I parachuted down to it, and spent a few minutes basking in the detail of the half-flooded buildings, the walkways, the garages with their rusted doors. And then I got shot in the head. That’s PUBG.